Cyperus filicinus.Donald Cameron.New England Wild Flower Society.gobotany.newenglandwild.org (Accessed 4/2014). Cyperus filicinus is an annual C4 sedge (Li et al. 1999), stems tufted, 10-40 cm long, slender, soft. 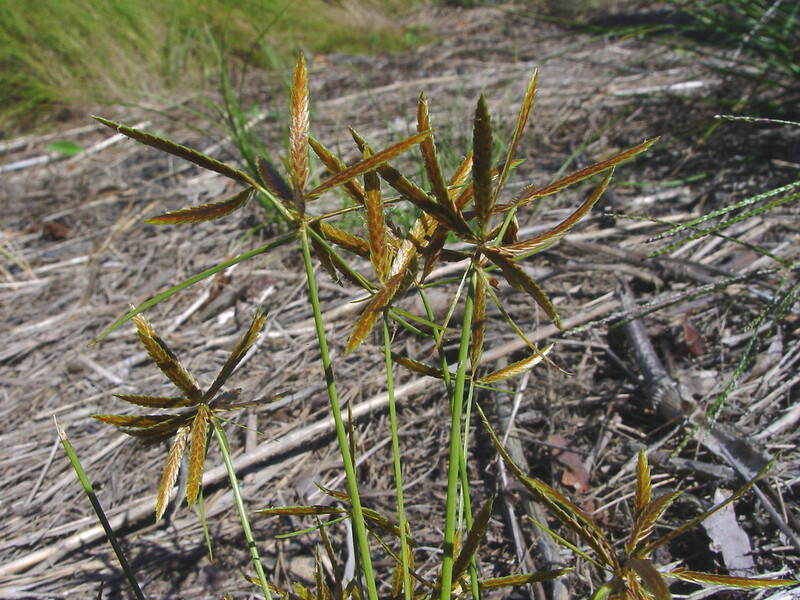 Leaves alternate, 0.1-0.3 cm wide, shorter than flowering stem. Flowers dry, tiny, no petals or sepals, stamens 2, each flower covered by a straw-color, shiny, narrow scale, about 0.3 cm long; flowers crowded in ranks along spikes 1.5-2 cm long, 0.3 cm wide, very flat, stalkless or stalks (rays) to 10 cm long, inflorescence often of a dense radiating cluster of spikes, subtended by several leaf-like bracts to 25 cm long, 0.1-0.3 cm wide. Fruit dry, 1-seeded achene, lens shaped, brownish. Habitat: Brackish marshes, beaches, in wet hollows.